I attended this weekend’s 24 hours of flickr party at the Ayala Museum. Having been a flickr owner for some time, I went there in hope of nothing but just meeting fellow flickr friends and to celebrate with flickr. Yes, flickr is that nice for me. Its simplicity and versatility has so much love. <3 <3 But I was utterly surprised with the freebies given to the attendees ( Pro Accounts Baby yeah!) and of course Ayala Museum’s great grub! The food was great and perhaps the best I tasted so far. It was beyond the usual canapes and their blends of mixing fruits with cheeses were superb. Who knew that Kesong Kalabaw (a local cow’s cheese) would match with papaya. Who would have thought of pomelo tarts? 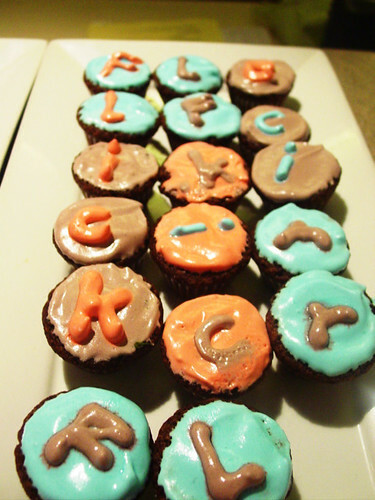 Even Flickr Cupcakes!? Well they did and they tasted great! My favorites for the night were the smoked peppers with Kesong Kalabaw and their roast beef which was just divine (and cooked well, at that!) I heard that the cafe itself has great meals and maybe someday, when I have some extra cash I’ll get into eating in that restaurant! sayang! di bale next time sama ko ha? sunday brunch? will it qualify as a lawson lunch? Hello webmaster…Man i love reading your blog, interesting posts ! it was a great Sunday .